And finally, the den becomes a teenager's bachelor pad and stereo room. 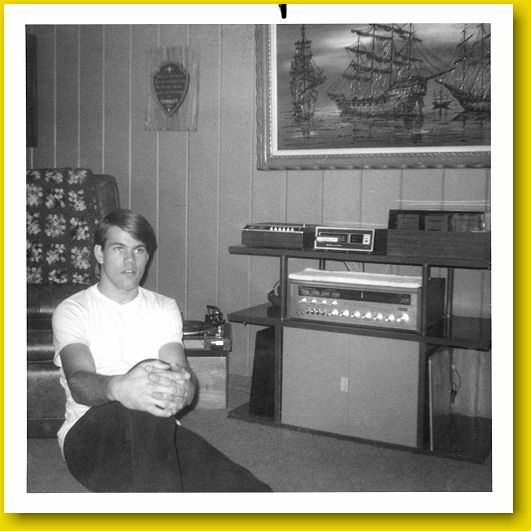 Here I am, a skinny 18 year-old with huge hands, sitting proudly in front of my quadraphonic stereo system, housed in a cabinet we found at a garage sale. I, of course, painted it avocado and then antiqued it. (Like father, like son). Those sliding doors in front were painted beige - I had a can of spray paint this color and wanted to use it for something. Mom crocheted the comforter of 100% acrylic yarn. No natural fibers in our home!